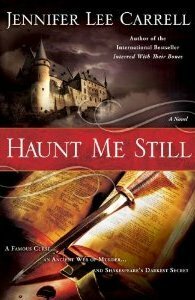 Haunt Me Still, the second Kate Stanley novel from Jennifer Lee Carrell, finds the Shakespearean stage director entwined in dark mystery surrounding the Scottish Play. Summoned to Dunsinnan by former Shakespearean actress Janet Douglas, Kate is asked to help unravel the circumstances surrounding the mysterious death of the Lord of the Manor, who was tracking down a reportedly fabulous addition to his Macbeth collection, a legendary “first draft” of the play containing a detailed description of a forbidden ritual. All manner of dark arts are unleashed throughout the story, leading up to a hair rasing climax in a remote Scottish castle. There are plenty of witches here, both old and new, as well as a hefty dose of theatre history…all wound together in a tight and riveting plot. Carrell again tells two stories in time shift mode — Kate’s story in the 21st century, and Elizabeth Stewart, Lady Arran’s story in the 17th century. Both stories meld into one another throughout, and this time, the dual stories work a little better, primarily because there are fewer characters in here than in Interred With Their Bones. Carrell has continued to flesh out the character of Kate Stanley and I am anxious to see where she goes next. The plot here is unusual, well-researched and exciting, although there are a couple of predictable and pat scenes. Finding the lost manuscript in a convent-turned-university in New York State is stretching it a little, as is the gory sacrifice scene in the British Museum. Even so, this is a solid read and a successful addition to what I hope will become a well-established character series. Also, there is a killer book trailer on Amazon — check it out. Makes me hope this becomes a film.